TRIENS America is pleased to announce our expand G-series Dual Pedestal Heavy Duty Reels.  Medium frame reel (Model# starts from GM) now available for hose length up to 85ft.  Air, Water, Oil and Grease. 200 to 4000PSI.  Dual pedestal for additional stability, reducing vehicle vibration. Perfect for all work truck applications. *Length and working pressure vary with model. Please refer to product pages for additional details. 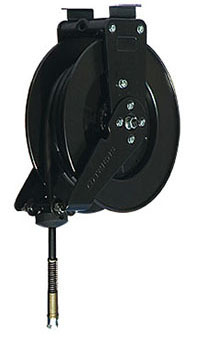 For product lineup and additional information, please visit G-series reel pages. We will be expanding our G-series lineup to include large frame reels. Details will be available soon.